We offer you the following shipping methods for international shipping, which can be divided into two categories: Postal Service and Courier. - DHL Direct is available for parcels sent only to the United States. There are certain conditions such as sizes of parcels, restricted items, etc. - SF Express is available mainly for Asian countries such as Taiwan, Hong Kong, etc. - Surface mailing is not available. - The information is as of December 2017 and might be altered or revised. It depends on your package size and weight. For small items, like CDs and magazines, SAL "small packet" is the cheapest option. For other packages, please refer to our Shipping Calculator. Which shipping method is the fastest? FedEx/UPS/EMS are among the fastest and SAL is the slowest. For cheap and small items, we recommend using SAL "small packet". For other items, we recommend using EMS as it is the most reliable and reasonable shipping method. When should I use FedEx/UPS? When it is cheaper than EMS. When your package is too heavy or too long for EMS. When you want to send books, equipment, and other heavy stuff. You can check the shipping fees with our Shipping Calculator. Can international shipping be free? No, international shipping cannot be free. Some items sold on Rakuten and Amazon come with free shipping within Japan. In these cases we do not charge clients for shipping within Japan, but international shipping is always subject to an additional charge. "Small packet" is a shipping option for small items. It is the cheapest shipping method available, but it has size, weight and insurance limitations. "Small packet" can be sent by Airmail or SAL (cheaper and slower version of Airmail). The maximum weight is 2 kg. Length(a) + height(b) + depth(c) <= 90 cm. Can you ship big/heavy/long items? Shipping limits depend on your country and the shipping method you choose. You can check size and weight limits for your country with our Shipping Calculator. Each shipping method comes with its limitations by parcel weight or size. Sometimes the shipping method you choose may not allow to ship all the chosen items in one parcel. For such a case we provide 3 packing strategies for you to choose from when creating a parcel. We will pack as many items as possible, and the remainder will be returned to the warehouse. As principle, priority is given to items that have been at the warehouse the longest, however it is not always applicable depending on the items’ size and dimensions. We change the shipping method to the next cheapest available one to send all the items together. Please note that this may not be applicable if the chosen shipping method is already the last available one. Your items will be split into two or more parcels fitting the chosen shipping method. This is often used for Small Packet (SAL or AVIA) or for items that cannot be packed together (like a fishing rod and a fishing reel). Each parcel will be treated as a separate one, i. e. will need to be paid for separately and have its own tracking number. Contents: Three items (A, B, C). Weight of all 3 items packed together exceeds 2 kg. Item B is too long to be packed with the other items. A and C are packed to be shipped by SAL small packet and B is left at the warehouse. *As principle, priority is given to items that have been at the warehouse the longest, however it is not always applicable depending on the items’ size and dimensions. All 3 items are packed together; shipping method is changed to SAL (standard). 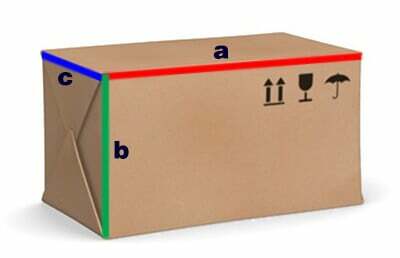 3) Split items in two or more parcels Two parcels are created; A and C are placed into parcel #1 and B into parcel #2. *Each parcel is treated as a separate one, i. e. needs to be paid for, reinforced separately if needed and is assigned a separate tracking number. What items are prohibited for shipping? There are various goods and items that are prohibited for export from Japan such as inflammable items, fauna and flora, items on the CITES list (more details here). Also, every country has their own list of prohibited items for import. Therefore, a certain item can be sent out of Japan and welcomed into a country, but the very same item might be rejected at the Customs of another country. You can refer to the following Japan Post pages for more information. Please note that they are all written in Japanese. There are other items not included in the above pages but are rejected for sending by Japan Post. Also, there are certain items that are not available in certain shipping methods. EMS: Accessories and valuable items such as rings, necklaces, pendants, bracelets, etc. consisted of precious metals such as gold, silver, platinum etc. If a parcel that contains these kinds of items will be shipped by one of Couriers, it will be stopped by the Customs and will probably be disposed. What are the customs duties? Usually, you can import a certain amount of goods without having to pay any customs fees. The customer is responsible for covering these additional costs; as customs duties and restrictions are different for each country, ZenMarket cannot give an estimate beforehand. Please use a Google search in your language for "customs duty import" with your country name. After your items have arrived at our warehouse, you can decide when, where and how to ship them. To begin, go to the "Packages" tab on your account. Once you specify your shipping details and pay for the international shipping, we will ship your package within 2 days. Yes, all packages have tracking numbers. You will be able to track your package from your account once the package is shipped. Can you make my package really strong? We consolidate your items and pack them for free, with regard to the item's fragility, size etc. In most cases, our packages are strong enough to endure most situations. If your package is especially big, heavy, and you are worried about your items' security, we recommend using our framework service for 1000 yen per box. Your package will be strengthened by hard pressed carton angles fixed with staples or/and by using extra packaging materials. Please note that it is necessary to order this when you create fragile items such as turntables. Can I ask you to mark my items as "gift"? Unfortunately, we are not able to mark items as "gift" in the invoice. We have to mark all of our packages as "merchandise". Hope for your kind understanding. I have created a package and received a quote, but I want to reorganize it. Is it possible? If you want to change your shipping method, you can do it for free on the Packages tab. If you created a package, but then change your mind and want to repack it, it will cost an additional 1000 yen. How much is the package insurance? You don't need to pay the package insurance for AVIA, SAL and EMS. In case you send a parcel by Small Packet method, a ZenMarket special insurance fee may be charged in order to secure a full refund in case of a loss by the postal services. Also, some insurance fee applies in case you want to lower the declared value of goods. For courier services we might charge an insurance fee of 0 to 2% of the price of the parcel contents depending on the respective service insurance system, country of destination, parcel contents price and other factors. I haven't received my package yet. What should I do? All packages have tracking numbers, and you can check your package's tracking records from your account. If 1 month has passed since the shipping date, and you still have not received your package, please contact us. We will request the Japanese Post to initiate the investigation. It takes up to 2 months to conduct an investigation, but don't worry, all packages are insured. Investigations take time, but you will receive either your package or your money back. * Although FedEx offers an insurance for delivery delay, this is not applied to our services. If you see that your package is damaged or has been opened, DON'T RECEIVE it and DON'T SIGN for delivery. In this case, go to the post office where your package is stored and ask the postal worker to open the package in front of you before signing for delivery. If you see that your items are damaged, declare the loss or damage right at your post office. Make sure that your claim is accepted. After this, send us the copy of your claim. We will send a request to the Japanese Post to start the compensation procedure. Buy from one Japanese shop to reduce shipping fees within Japan. Use your home address and not an office address for shipping. Check your country's customs duties and postal method's size/weight restrictions in advance.